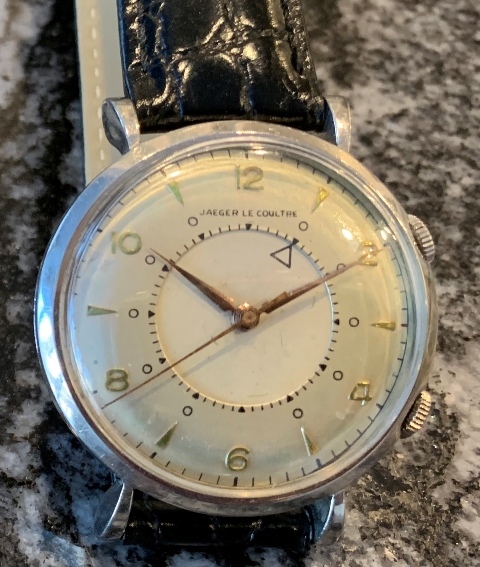 Jaeger LeCoultre Memovox stainless steel alarm watch, dated by serial number (837741) to circa 1951. The manual wind P489/1 manual wind movement is working well and keeps time. The alarm sets and winds using the upper crown, the lower crown winds and sets movement. Photos are magnified and show details not seen by naked eye, the case measures 35 mm across (not including crown) x 41.5 mm lug to lug and is fit with a leather bracelet.